I’ve always had a keen interest in architecture, nowadays it seams bigger than ever. Probably because I have been lucky enough to find some interesting books at my college library about the modernism and functionalism in Sweden. The modernism architecture was introduced in Sweden during the Stockholm International Fair in 1930 and really set a standard for the design and lifestyle during the following decades. Everything had a clean, simple and functional look, hence the word functionalism. The 1950s and 1960s were especially influenced by this, everything from shopping malls, to gas stations to apartment complexes. They blended big chunks of concrete with glass, steel and wood to create a semi-futuristic look. I especially remember the distinct grayish look of the department stores when I was a kid. 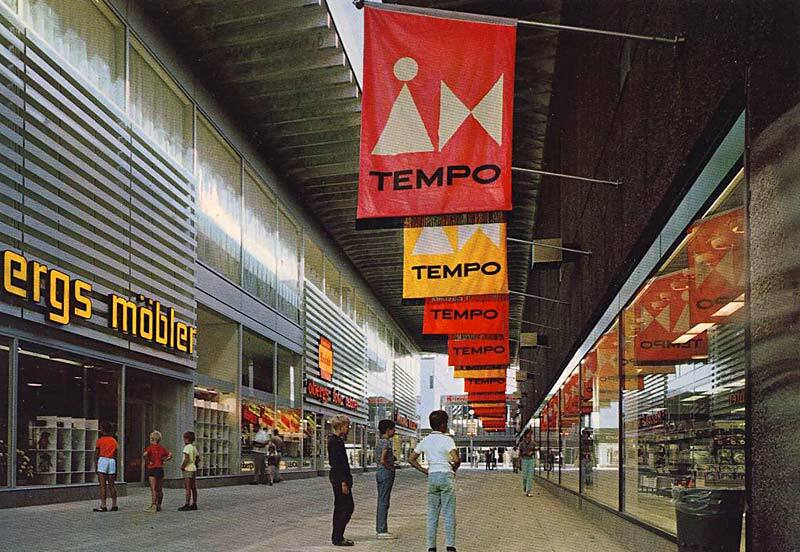 Of course they are all gone or totally revamped now, but I dug in my archives and came up with these three postcards depicting Swedish department stores and shopping malls during the 1960s and 1970s. I think there is a certain magical almost dreamy feel to them. Ever wondered why old-timers say that it was better back in the days? They were right. They always were.